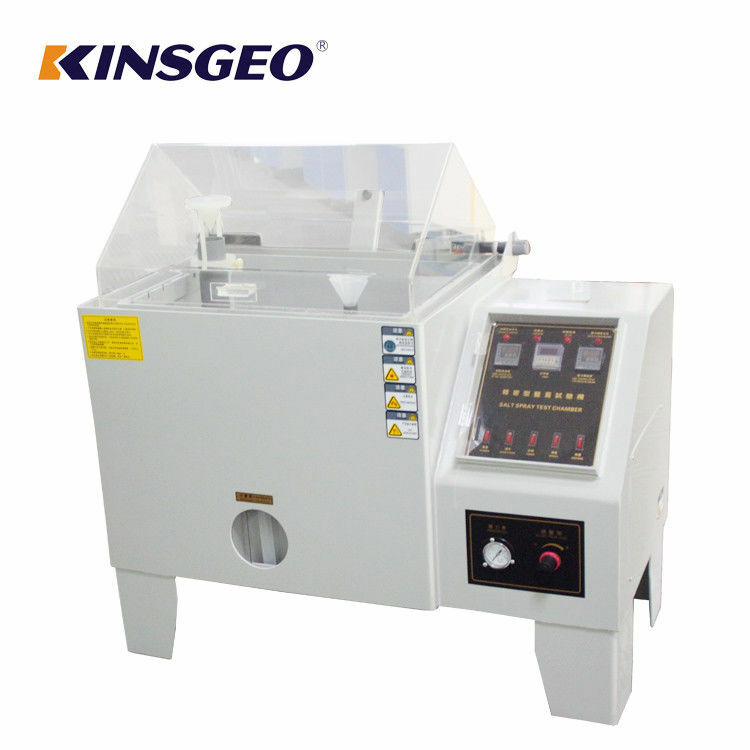 This machine for all kinds of metal material surface treatment, including coating, electroplating, organic and inorganic coating, anodizing, rust proof oil and preservative treatment test of its corrosion resistance, so as to establish the quality of the products. Equipment material: Both internal and external material is using imported P.V.C rigid plastic board; the case cover is using transparent rigid plastic board P.V.C. (A) testing room using PVC polyvinyl chloride plate (from Taiwan), acid-resisting and alkali-resisting, cleaning easier. (B) cover of testing room using acrylic panels (imported organic glass), the thickness is 5mm. (C) reagents added bottles attached with water gauge, cleaning easy and not easy to break. (D) saturated air barrels is made of SUS # 304 stainless steel. (E) testing room to adopt indexing frame, can be arbitrarily adjust the angle, Surrounded by fog and placed more piece . 3, Air supply system: air pressure 1Kg/cm2 Two-stage adjustments (coarse / fine-tuning). (A) the first paragraph for the rough adjustment 2-2.5Kg/cm2, the second paragraph to fine-tune 1Kg/cm2. (B) Testing configuration is switch connector designed for SO2. (A) Using Bo Nute principle to draw brine and then saline spray, atomization uniform, non-blocking and crystallization, so that ensure continuous spraying. (B) Nozzle: The nozzle is made of special glass, adjust spray volume and spray angle. (C) spray volume: Adjustable 1 ~ 2ml (80cm2/hr) (average of 16-hour volume). By direct heating, warming up faster and reduction of standby time, when the temperature arrives automatically switch ON / OFF, make temperature accuracy, low power consumption (heating tube is made of titanium alloy). 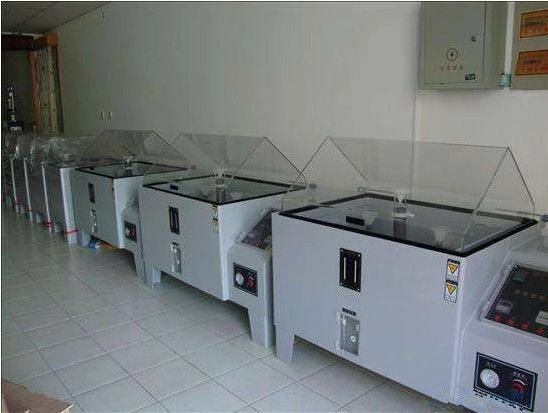 (A) testing room temperature controller is the digital micro-computer products 0-99.9 ℃, liquid crystal digital display with PID automatic calculation, the control error is ± 0.3 ℃ (YANG MING6802) 1 pcs. (B) saturated air barrels controller 0 ~ 99.9 ℃, liquid crystal digital display with PID automatic calculation, the control error is ± 0.3 ℃ (YANG MING6802) 1 pcs. 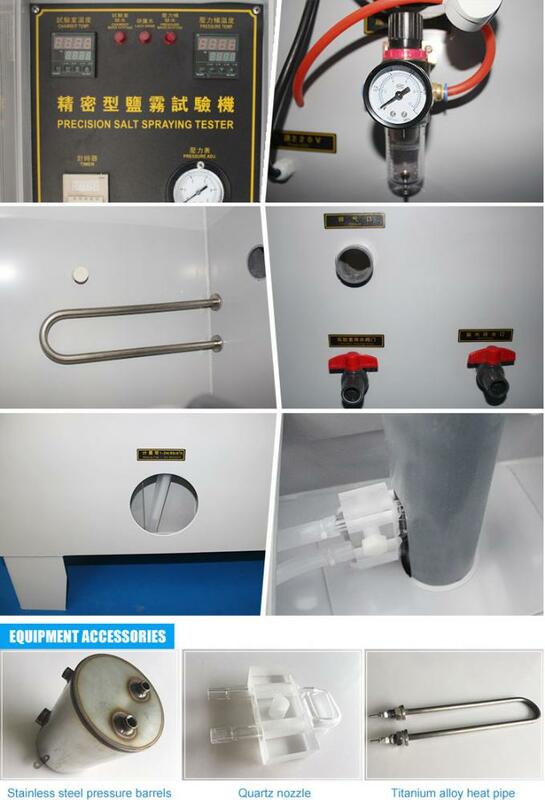 (C) safe temperature controller of heat expansion of the liquid tank 30 ~ 110 ℃ (Italy) 1 pcs. (D) safe temperature controller of expansion of the saturated air barrel : 30 ~ 110 ℃ (Italy) 1 pcs. (E) digital time controller 9.9s ~ 9990hr (Taiwan) 1 pcs. (F) timer 0 ~ 9999hr (Taiwan Anliang) 1 pcs. (G) buckle switch, continuous buckling 20000 times. (H) 60 type, 90 type for manual flip, 120, 160, 200 type for the pneumatic cylinde automatic opening and closing. (J) pressure gauge, (Taiwan B card). (K) fixture bleaker (YANG MING). Using automatic water replenishment system, automatic replenishment when the water level is too low. (A) low water level, automatically cut off power supply. (B) over-temperature, automatic cut off the power supply. (C) attached to the safe warning light device.